00:02 Chris Ching: So in this episode, we're gonna talk about Facebook Messenger and how you can take advantage of that great tool to help grow your business, either through driving leads, sales, booking appointments, it can do a lot for your business. 00:11 Aniel Samaroo: So it's really powerful, hopefully after you've finished watching this episode, we can get a little more insight into how you can use it and hopefully you guys give it a shot starting today. 00:20 Chris Ching: Yup, so if you want to get started, and you don't have it currently installed, if you go to your business page, and you click on Messenger platform, scroll down, and then it'll walk you through creating a script that you're gonna install on your website. So you're gonna set up a greeting and then you're gonna set an automated message for if you're away. 00:38 Aniel Samaroo: Creating that tree dialogue is really how you're going to interact with that customer right, so based on who your customer is and what you do, you want to make sure that you're hitting the key points and addressing what you think your user will be coming to your site to speak about, right? Addressing all their concerns. 00:51 Chris Ching: Yeah, so you can either set up those tree dialogues yourself if you know a little bit of code or, alternatively you can download a template. There are many templates available to you based on industry. So if you are in real estate or you're a doctor, obviously you're gonna want to walk them through a flow that makes sense for you to drive those engagements. Whether that's booking appointment or viewing a house. 01:12 Aniel Samaroo: Whatever it is. Speaking of engagement, what, the engagement rates for these. 01:16 Chris Ching: They are insane. 01:17 Aniel Samaroo: It's ridiculous, right. 01:18 Chris Ching: Just look it up, do yourself a favor, look it up. But if you don't have time, we'll tell you right now. Most of the engagement rates are over 80%. We've seen even as high as 95%. Aversion rates well over 50% and that's probably on the lower end. If you compare that to mail aversion and open rates, much higher. So, you're likely to see a lot more success working with a Facebook Messenger Bot. 01:41 Chris Ching: On top of that, let's say, I'm interacting with you on your website, right? 01:45 Aniel Samaroo: Right. Mm-hmm (affirmative). 01:45 Chris Ching: And I get busy and I need to leave and the conversation just ends right? That typically happens with a lot of bots if you're dealing with one. 01:53 Chris Ching: If you're connected and you lose connection and then you have to start all over. Well, the great thing about this is that never has to happen. The chat continues essentially until you close it. If I leave the website and I go on my Facebook, it's still there. It's also available on your mobile phone, obviously if you have the app installed you can continue there. But the great thing about that is now you're getting pings to your phone. 02:16 Aniel Samaroo: All the time, yeah. 02:16 Chris Ching: Right. So on top of that you can also engage people through comments if they, let's say, create a trigger word. 02:23 Aniel Samaroo: Mm-hmm (affirmative). Yup. 02:23 Chris Ching: If I'm looking to buy makeup for example and I mention that trigger word, the bots gonna population up and engage me on that. 02:29 Aniel Samaroo: Yeah, another powerful thing, is that once you speak with these people as a business, you can go back and market to them. So they're always gonna be part of your contact list. So if you do want to send out a message, it becomes like a mailing list. So if you have some new event, new promotion, anything that's happening, you can always reach back out to those people. Once they start that conversation, they become part of your community for the most part. 02:51 Chris Ching: Yeah, and especially if you already have a big Facebook following, it's a no brainer to get going on this. Most businesses are not taking advantage of it and we see a lot of competitors, working with our clients that are not taking advantage of it. So we absolutely encourage them to get into that space, get ahead of the curve and take advantage of every channel that you have available to you. 03:13 Aniel Samaroo: Especially because it's so easy. It's one of those things that's like, just give it a shot. Secondarily, also, it eliminates some of the spam and bots that you get on the internet. Right, people, you think it's an inquiry, you go, "Wow, I got a job inquiry for my email." You look, and it's just another, somebody else offering off shore service, or whatever it is right? You get a ton of these things but you gotta have a valid Facebook account to chat on Messenger. So it kind of pre qualifies who you're speaking to, in terms of a like a real person. 03:38 Chris Ching: Yeah, so it's great to let the bot handle that for you, qualify people, you can jump in if you feel like it's a hot lead for you. The great thing about it as well is that you don't have to constantly manage it. You can just set up these tree dialogues, qualify everybody and let the chat bot take advantage of the rest. 03:58 Chris Ching: So one thing that you want to be mindful of is if you are using a chatbot make it clear that job yeah right like say this is my assistant here to help you answer a few questions and then we’ll connect you with a rep. Most people find that that transparency will help build trust and knowing that they are talking to a bot and not being deceived, you know, into thinking that it is a person when it really isn’t goes a long way with the customer. 04:24 Aniel Samaroo: Especially now people are used to that form of communication of typing stuff up; you are texting all day… you are used to that form of communication so the transparency I think helps people just communicate. 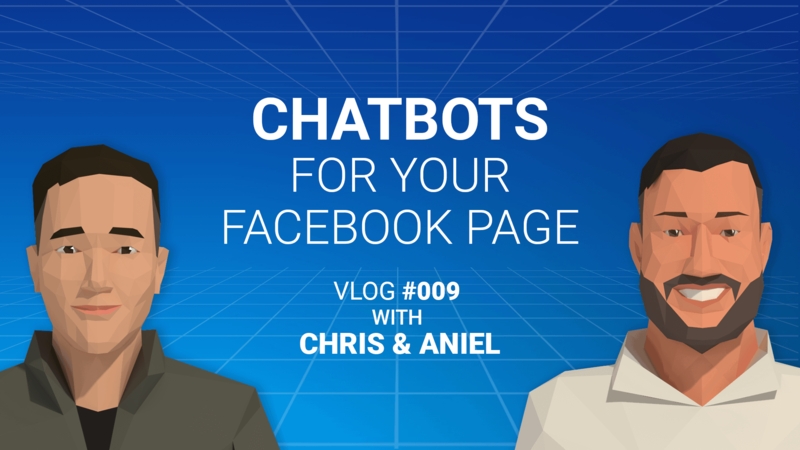 04:33 Chris Ching: Yep, that’s how you can actually drive sales in facebook with messenger as well so that can be another great channel for you to push your products if you’re not already driving to your website, you can make the transaction happen right in the chat bot. 04:45 Aniel Samaroo: Also, Facebook does a pretty good job of providing analytics as well. So that’s a whole separate topic. Talking about tracking measurable stuff, but they do a good job of providing things that data could possibly help you. 04:56 Chris Ching: So, hopefully that was some good advice for you to hear. If you are not trying to take advantage of Facebook Messenger, do yourself a favor and set it up; it only takes a few minutes. If you guys have any questions or comments about specific bots that you are looking into or if you just want to engage with us and see, you know, and share some results that you might have gotten let us know. Post, comment, like, share. 05:19 Aniel Samaroo: Alright, See you guys next time.